Returning (left) and Cleopatra can be found at Dovecote, a model landscape garden in Cashiers that showcases several of Peverall’s works. Peverall installed this piece, Partnership, outside the Grove Park Inn in 2013, and it was later purchased for a homesite. 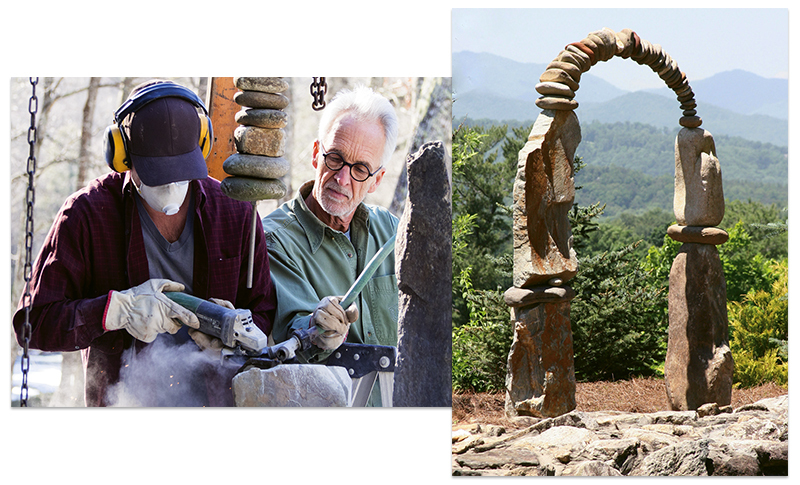 The artist now works with his son, Ethan, on major stoneworks. See for Yourself - Find an overview of Peverall’s works, in stone and other media, online at www.carlpeverall.com. One of Peverall’s more whimsical commissioned works, Minstrel, is at a private residence in Highlands. He and his son have completed about 50 such pieces, some of which can take up to a year from start to finish. The artist now works with his son, Ethan, on major stoneworks. Peverall installed the above piece, Partnership, outside the Grove Park Inn in 2013, and it was later purchased for a homesite. With a slender build, snowy white hair, and steadfast serenity, Carl Peverall is not necessarily the type of person you imagine arranging heavy stones. Yet, the Virginia native, who was raised in North Carolina, creates astonishingly large and stunning sculptures. Peverall’s technique is simple: He finds stones that stabilize one another and, with a drill and steel, adjoins them. There’s minimal alteration, and the anchoring is invisible. In both his archways and statues, the scale, complexity, and balance of the pieces astound. “What I hope to do is connect the material with some sort of visual poetry,” says Peverall, who’s also a painter, potter, and instrument-maker. His works are indeed kinds of poetic narratives—odes to visions, emotions, and friends like Chris Booth, a New Zealand sculptor who originally inspired Peverall to work with stone. Peverall returned to artwork and landed an internship with the National Park Service replicating indigenous pottery on Cape Hatteras National Seashore. Shortly thereafter, he secured a grant to be a working artist on a farm in Union County, NC. In the early ’80s, he opened a studio in Charlotte before making his way to New York, where the Hudson River Valley inspired him to begin painting landscapes. Then, with children in tow, Peverall felt called home to the South, so he relocated to a wooded property along the crystalline waters of the South Toe River in Celo. These days, his yard serves a de facto studio, with chunks of stone strewn about. And Peverall has a trusty partner for his work: his 26-year-old son, Ethan, who’s taken a shine to sculpting as well. Find an overview of Peverall's works, in stone and other media, online at www.carlpeverall.com.